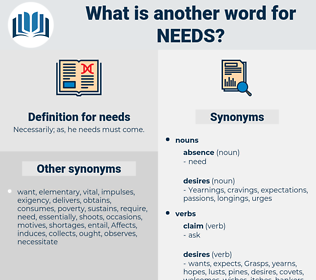 What is another word for needs? Necessarily; as, he needs must come. needed, required, as-needed, needs-based, require, needy, demand-side. Communities, products, necesidades, Resources, services. must, considerations, necesidades, planned, administration, education, expectations, include, should, Responding, in, taken, organization, advancement, address, want, undertake, statement, respond, des, new, planning, Resources, making, response, minimum, taking, society, learning, Into, promotion, strategy, debit, be, services, november, deal, research, highest, ontario, shall, have, adopt, us, voice, pension, bank, may, capital, national, board, to, group, home, pacific, answer, quota, Of, c., reply, will, might, at, take, takes, cash, li, south, meeting, meet, require, is, make, Mr..
ends, communications, times, characteristics, Emergencies, Recommendations, prerequisites, responsibilities, matters, Expenditures, appropriations, dissemination, circumstances, establishment, establishments, operations, D, conditions, attention, improvements, shortages, shortcomings, interventions, principles, directives, restrictions, conservation, authorities, initiatives, competencies, concerns, expenses, descriptions, preferences, decisions, Governments, representatives, intents, orders, interests, Duties, professionals, Consultations, transparent, trends, Evaluations, limitations, recipients, partnerships, technologies, issues, petitions, Organizations, departments, provisions, innovation, assessments, reservations, complaints, advantages, challenges, Standards, Investments, enterprises, clientele, thousands, amenities, objectives, years, recognizes, uses, providers, Communities, Municipalities, constraints, chances, Populations, institutions, Entities, segments, regions, relationships, stakeholders, Guidelines, transactions, Capabilities, sessions, besoins, Budgets, factors, mechanisms, applications, partners, consumers, Canadians, Businesses, experiences, Opportunities, Industries, instances, jobs, weaknesses, benefits, wants, suppliers, Beneficiaries, being, L, Commodities, location, Languages, submissions, remains, Regulations, Efforts, centres, points, Researchers, pressures, strengths, citizens, opinions, provides, situations, technical, immigrants, questions, handicaps, modes, alliances, Disabilities, arrears, Abilities, strategies, treatments, reasons, customers, Companies, steps, details, supports, Possibilities, personnel, relations, targets, solutions, Diseases, dollars, articles, patterns, Capacities, subjects, estimates, Charges, Rights, Agencies, annex, statistics, Ones, Measures, outcomes, reserves, listen, individuals, systems, invites, practices, features, offers, euro, Euros, effects, values, forecasts, programme, programmes, wishes, things, skills, players, functions, possesses, processes, forces, councils, Refugees, aims, users, options, tasks, protests, develop, must, fields, methods, Areas, directors, *, levels, Families, aids, concurs, Tastes, supplies, projects, costs, Lives, actions, Generations, topics, Activities, funds, terms, february, imports, elements, Parents, aspects, affairs, peoples, shares, models, agrees, grounds, cases, Fears, assets, powers, stays, Realities, troops, views, groups, seats, problems, sources, page, Motions, quotas, SMES, norms, speakers, _, teams, markets, Habits, victims, Persons, Children, Countries, loads, ways, products, results, women, item, items, Goals, Bodies, approaches, people, employees, airports, plans, stay, nations, others, parts, on, tools, Schools, considerations, members, Drugs, Facilities, :, place, asks, actors, calls, officers, Programs, Policies, go, claims, account, 96, ha, Has, 102, Parties, sexes, lots, flows, look, looks, specifications, 2002, 2011, expectations, goods, organization, advancement, makes, Resources, implement, taking, learning, promotion, be, services, shall, may, to, take, is. Demanded, wanted, 'd, bet, Got, required, shall. additional, mandates, indicates, definitions, obligation, intends, defines, mandatory, cooperation, corresponds, involves, includes, considers, duty, evaluation, constitutes, assumptions, in-depth, stipulates, failure, progress, network, organisation, insists, presents, measurement, environment, likes, concludes, multilateral, comprises, Recommendations, communication, prerequisites, represents, external, enjoys, resource, opportunity, industry, matters, provide, question, underpins, improving, notes, maintains, explains, expects, dictates, contains, heritage, relies, consists, ability, helps, delivery, continues, adds, regarding, regards, specifies, managers, capacity, finds, Gives, elaborates, subject, operates, system, D, conditions, thrives, examples, belongs, competences, attention, quality, receives, right, assumes, together, urges, competencies, concerns, impose, imposes, clarify, clarifies, action, sees, follows, security, lies, interests, becomes, range, seeks, implies, effective, framework, problem, know, means, issues, monitoring, work, working, works, latest, occurs, access, challenges, holds, Faces, Standards, Comes, objectives, recognizes, creates, uses, awaits, fulfils, rates, more, stakeholders, places, types, Capabilities, covers, ok, Bears, factors, applications, Carries, \, OJ, draws, Opportunities, on-line, benefits, says, wants, L, passes, location, call, related, remains, road, points, provides, applies, questions, runs, goes, suits, Abilities, reasons, customers, steps, supports, Possibilities, targets, Capacities, Rights, Plays, Measures, outcomes, invites, practices, features, offers, effects, C, Forms, programmes, wishes, skills, possesses, meets, aims, tasks, Clients, Doing, Does, develop, must, fields, Areas, aids, concurs, costs, S, actions, funds, acts, imports, elements, shares, agrees, stays, problems, gets, name, victims, Persons, Countries, results, item, Goals, approaches, plans, stay, on, 's, members, place, asks, calls, claims, Has, lots, looks, education, expectations, Responding, in, organization, makes, respond, Resources, response, taking, learning, strategy, services, training, shall, to, Of, takes, meeting, is. needed, specifications, required, accommodate, contingent, reporting, necessity, implement, formation, training, sector, serve, Requiring. necessitates, imperatives, importance, Deficiencies, Exigencies, requisites, assistance, qualifications, competences, desires, Aspirations, Difficulties, contingents, Criteria, livelihoods, assignments, means, failings, warrants, cravings, hardships, merits, mental, requests, utilities, Clients, welfare, WOES, materials, premises, assists, sectors, faults, amounts, contingent, needy. subsistence, sufficiency, diligence, livelihood, diploma, toilet, flavour, necessity. depends, necessitates, deserves, exists, presupposes, Entailed, entails, suitable, capability, greater, assistance, OWES, customer, associated, arises, request, serves, attaches, safety, Communities, warrants, merits, requests, amounts. comfort, fortune, plenty, luxury, riches, wealth, have. But my mother needs me this winter. It is only on time she needs to keep watch. nietzsche, natchez, nuts, nantes, Nentsi, NTIS, nut house, nontoxic, nanticoke, nootka, nidus, nineties, nentsy, name tag, notch, nates, notechis, nomothetic, nowadays, nut case, nudge, nutcase, ninety-six, notecase, nuytsia, nimitz, nonnomadic, nuthatch, nenets, nuthouse, naiadaceae, notice, nautch, noetic, nomadic.